Daniel and I spent all day Sunday prepping our new trailer (picked up Saturday night!) for the trip to TX. 540-some-odd miles. 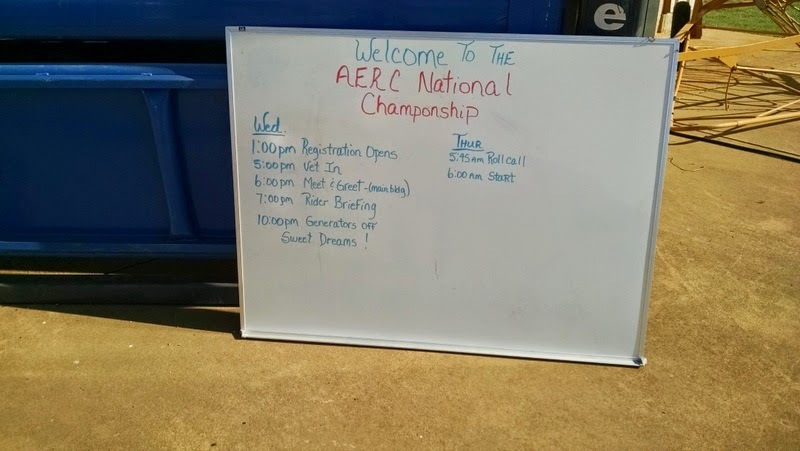 Destination: AERC National Championship, Priefert Ranch, Mount Pleasant, TX. Monday morning, Daniel zipped off to the tire shop to replace the trailer spare tire while I hauled hay and finished 100 little chores. 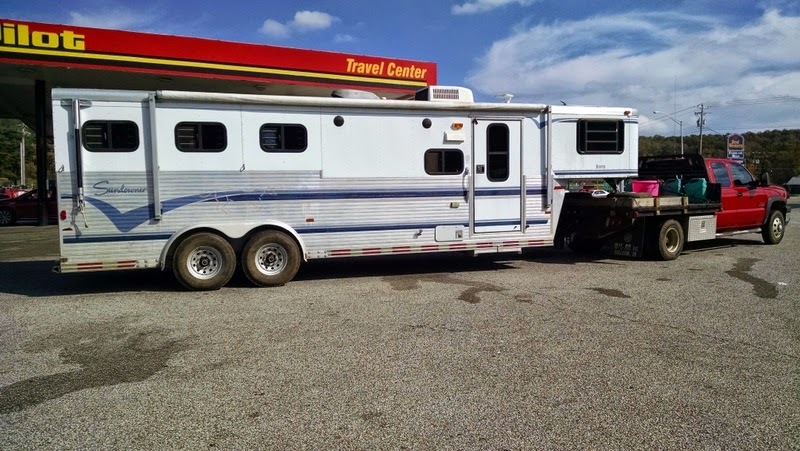 Finally on the road with Tanna, entered in the 100-mile championship and Sasha, my new endurance prospect, along to be Tanna's buddy horse and get some more experiences. 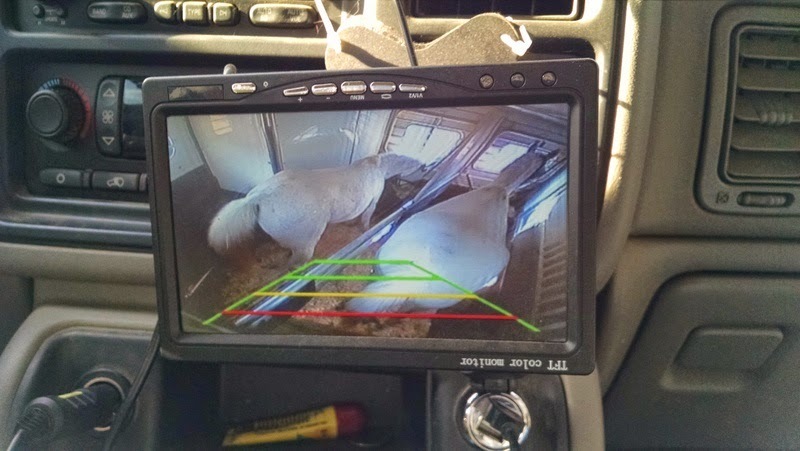 Trailer cam had to be added before we could leave. We arrived at camp around 7 PM and were met by the ride manager and her husband and led to where we were going to camp. Being the first non-management/volunteer rig to arrive, we got our pick of the parking. Daniel parked right across from where the trails enter and leave camp. 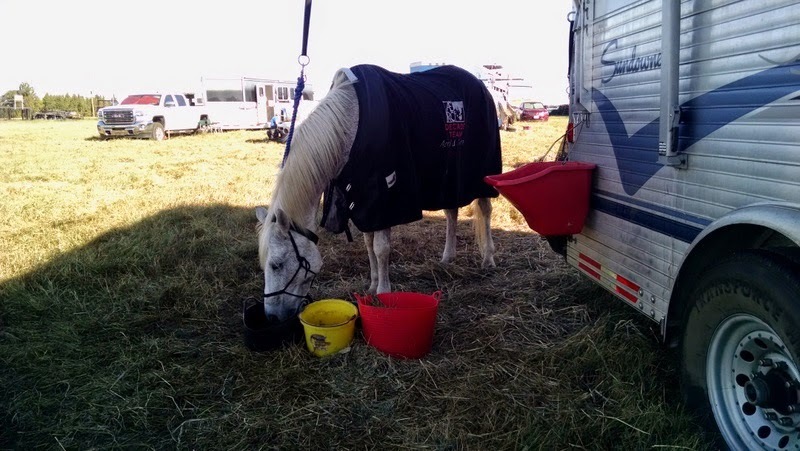 We were able to quickly set up camp, putting out the high ties, hay bags and water buckets. We walked the horses for a good hour, scoping out the start of the trail and walking the last mile of the loops. Tuesday, I decided to ride Sasha. I attempted to pre-ride the trail, but after the 3rd gate in 1/4 mile and lots of cows in the pastures (this IS a working ranch after all!! ), I decided to retrace my steps and left the pastures behind. 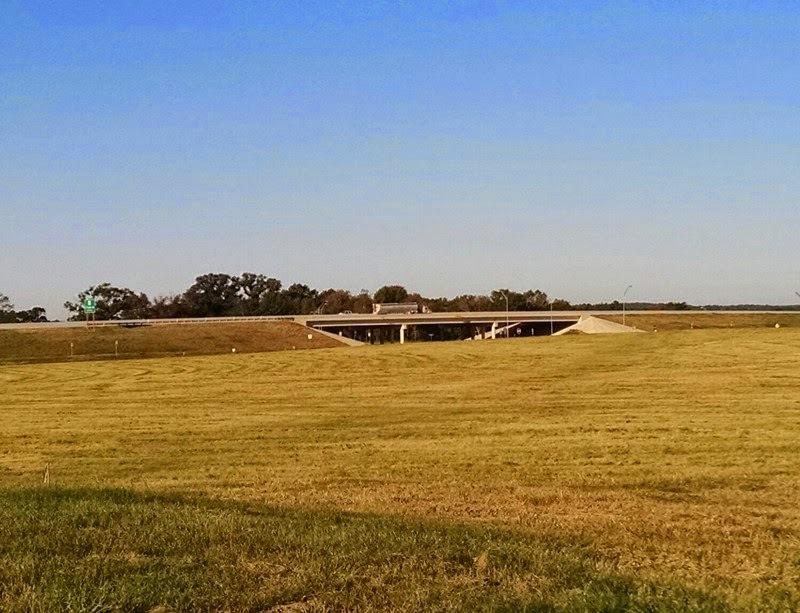 All but one of the loops out of camp passed under the new highway 271 and all the loops came back that way. When I rode Sasha out that direction, I had dismounted to walk her under it. The thump-thump-thumping overhead scared her pretty badly, so I was glad to have dismounted. 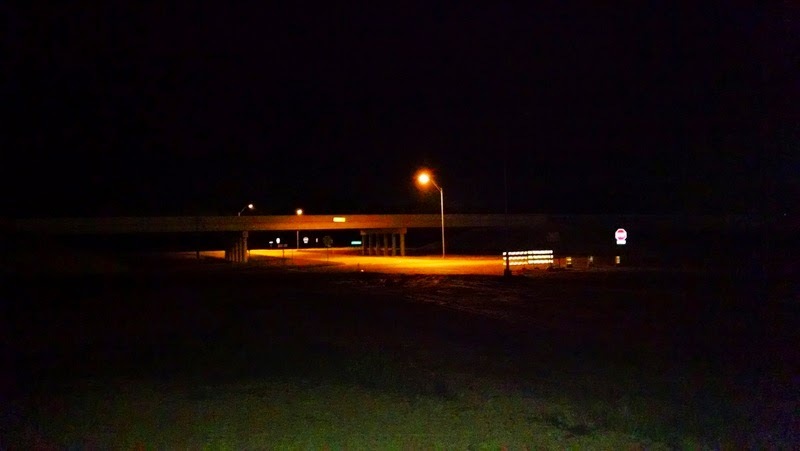 Since I decided to not pre-ride the trail after all, I spent 45-60 minutes getting Sasha used to the overpass. First we stood back and I let her watch the trucks and cars going overhead. And she did look. After she was bored, I moved her closer until we were under the overpass. We did leading games for a good long while under the overpass until her reactions were mild and her heart rate reasonable. Sasha and I finished up our ride by doing 4 or 5 laps around the field that made up the last mile for all trails. I got a quick shower and walked the horses before my boss showed up to see how we camp and how I spend my off time. Daniel and I showed off our new trailer and then we all headed to eat at the nearby Chili's. Sasha after her 15 mile training ride. Wednesday, I rode Sasha again. I dispensed with the idea of trying to open the gates and just stayed in the large field next to camp. Round and round and round we went...for over 15 miles. Good enough recovery and performance to make me think she might be able to try a 25 mile ride in the near future. Wednesday afternoon, we checked in for the 100 mile ride and vetted in. We zipped off to the nearby Walmart for a few last-minute things and back for the ride meeting. Thursday morning, alarm at 4:30, mounted by 5:45, start at 6 AM in the dark. I used my "nighttime" helmet that has a light mounted to it. Also had a Garmin Virb camera mounted. Loops 26 miles, 25 miles, 15, 10, 11, 11. With hold times 50, 50, 40, 30, 30. The riders all started at a walk. We soon picked up a slow trot and stayed together for awhile, but then we all begin to separate. 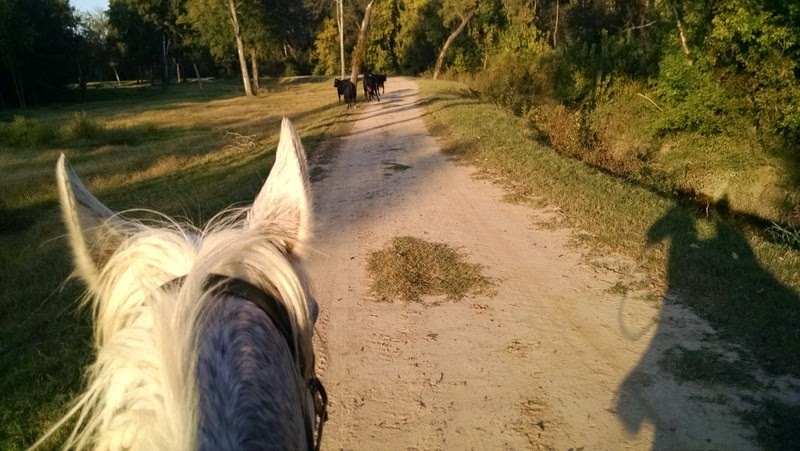 By the time we reached the first gate into the ranch, Tanna and I had separated to the back. Tanna does much better on his own in these situations. Has a much better attitude and pays attention to his feet. It was a little freaky riding in the dark on trails I'd never ever been on. The other night rides I've done, I've known the trails very well in the daylight. But after awhile, I relaxed and enjoyed myself. At one point, we passed a herd of cows just a few feet to our left. They were all staring at us. Freaky reflections from my headlamp. Fortunately, Tanna did not even flinch. The first loop was actually 2 loops. The 11 mile loop, dismount and trot for the vets and then the 15 mile loop. When Tanna and I finished the trot out, I put him on his high tie while I switched helmets. To my surprise, Tanna was eating. So I waited for about 10 minutes until he decided he was done eating. Then I remounted and off for the remainder of the 1st loop, which was the 15 mile loop. We were pretty much by ourselves for the entire ride. 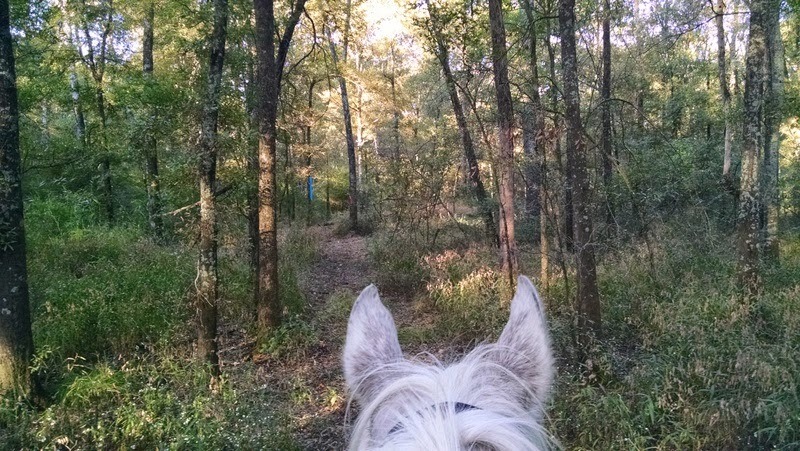 We'd occasionally see other riders on other parts of the trail, but we didn't ride with anybody else. At the vet check, we pulled tack and took Tanna right to the vet. Good vet scores, everything was a go. 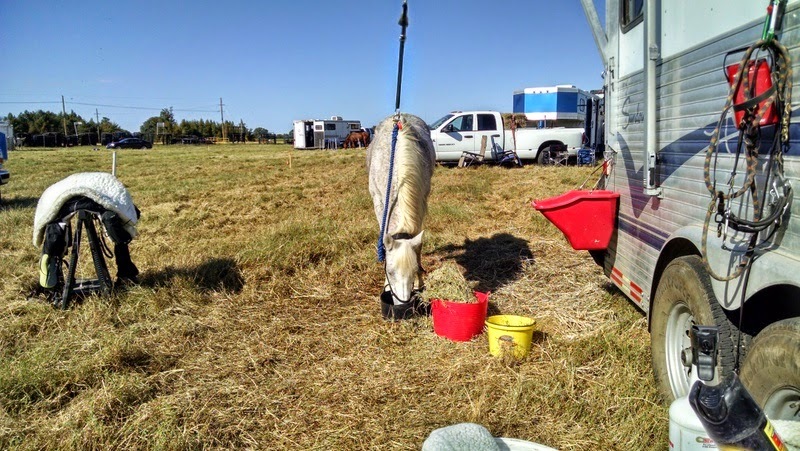 Back to the trailer where Tanna proceeded to eat heartily, including his beet pulp. He doesn't normally eat beet pulp during a ride, but I was happy to see him doing it. When I pulled his tack, I noticed he had a little bit of hair disturbance on his right loin. So I decided to put some Show Sheen along the back of the saddle pad. But when I was remounted and headed to the release timer to go back on trail, I realized I hadn't done that. So Daniel told me to go ahead and he'd get the show sheen for when I passed back by the trailer on the way out on my loop. There was a little mix up in my out time, so it took me longer to be released than we thought, so Daniel just brought the Show Sheen and my mounting block over to the release timer. I was cleared to go out on trail, but I hopped off and lifted the saddle to spray Show Sheen under it along the back edge to reduce friction. Remounted, I headed out on the next long loop. This was a very long loop. We saw some new trail that I enjoyed. I even saw some donkeys hiding among the cows. Tanna hit the 40 mile blues where he was confused why we were retracing our steps and not exactly happy we were alone. I let him mosey for awhile. It was warm and I don't usually clip for a single day. I did ask him to move out when it was breezy and/or in the shade. After awhile, (as he usually does), he perked up and moved out on his own again. Back at the vet check, I noticed Tanna a little ticklish in his loin area, but then didn't get any reaction. I asked the vet to pay special attention to the area, but nothing was really found at that point. In hindsight, I think he was guarding that area. He's a tough little guy and handles pain well. Maybe too well sometimes. Tanna was still eating well. Going back and forth between his mash (beet pulp, alfalfa pellets and Omolene 100), straight Omolene 100, alfalfa hay and carrots. I quickly braided up his mane for the next 15 mile loop. I was planning to take it easy on this next loop and hopefully pick up the pace after the weather turned cool again. Out on the 15 mile loop. This was the same 15 mile loop we'd done during the first long loop. Most of it was very nice, but there was one section I was very very happy to tell Tanna we would not have to do again. Tanna didn't seem to like it very much either. During this loop, Tanna's HR monitor showed brief periods of high heart rate, but usually, it would return to a normal rate. I thought at the time that it was electrode placement or maybe the battery needed to be changed. Still possible, but in light of the ending, I wonder if maybe he was showing some pain. This loop we had some cows standing in the road. They just stared and stared at us until we got within about 20 feet, then headed down the road in front of us. Back at the vet check, Tanna was reacting more on his back than he had previously. Too far back to be saddle related. We took him to the vet, but I had a sinking feeling we were done. Tanna trotted out slightly lame. 54/54 cri though. They held his card and we hand walked him and fed him and kept him warm, but when we re-presented, I watched Daniel trot him out and Tanna did not move right. Before Daniel got to the turn around, I had decided I was pulling him if the vets didn't. But as Tanna trotted back, I could see Tanna was off. Verdict was left hind, but high up, likely in the loins where he had been reacting slightly earlier. I think it started in the right loin, then the left had to compensate too much for too long. So our journey ended at 67 miles. I was disappointed, but pulling was the exact right thing to do. 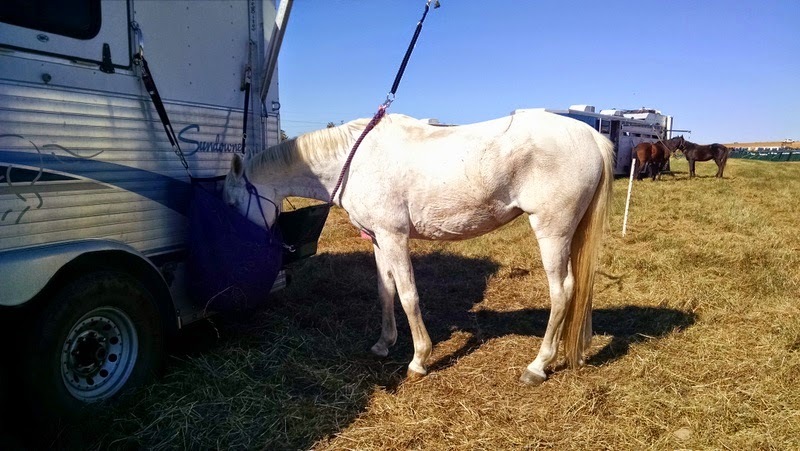 By Friday morning, Tanna was only slightly reacting when his back was palpitated and by the time we loaded him in the trailer to go home the next day, there was no reaction and no fill in his legs. A good recovery. From what I understand from talking to other riders and vets, the terrain likely played a role in the pulls. Other riders were pulled for similar issues. Lameness with the cause suspected or pinpointed high in the back end. 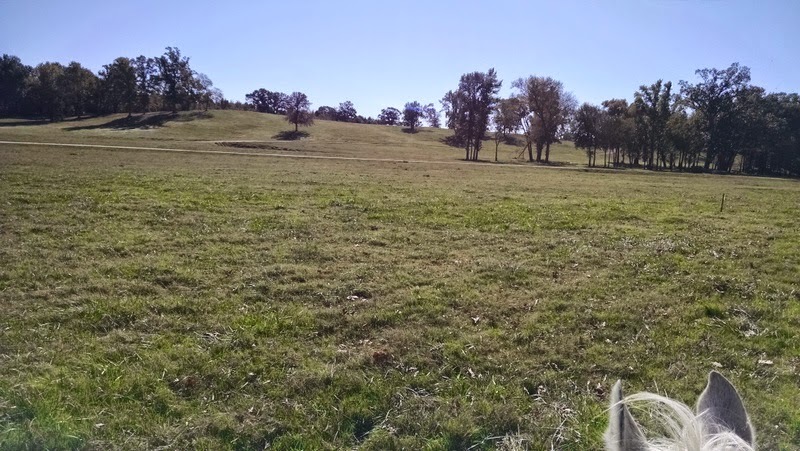 My personal thought is that the terrain caused the problem because while it was dry, the ground had dried in ruts and caused instability for the horses that didn't seem readily apparent. Riders from the back, front and middle were pulled, so it's not likely that speed caused this issue. I am glad we went and tried. Disappointed that we did not finish. But so glad Tanna is good to go for another day.